I'm SUPER thrilled to be guest posting on the Mushrooms Canada blog today. This pizza was created specially for them, and mushroom lovers everywhere! It's got bacon, which I'm obsessed with just a little bit fond of, and Boursin cheese, and fresh basil for heaven's sakes. Oh, and that balsamic drizzle is dreamy stuff. So head on over and grab the recipe, okay? OMG this looks amazing. I love love love balsamic vinegar (and Boursin -- which I've been eating since I was little and called it "bor-sam") and have been known to drizzle it over delivery pizza. I totally have to make this. Congratulations on the guest post! Thanks Steph and Lisa! This pizza was fun to do, and I'm super happy I have extra pizza dough in the freezer so I can re-create it soon. Yay! I think I just discovered a new favorite pizza! Mmm. I've never made a pizza crust with eggs before. You can freeze it too? 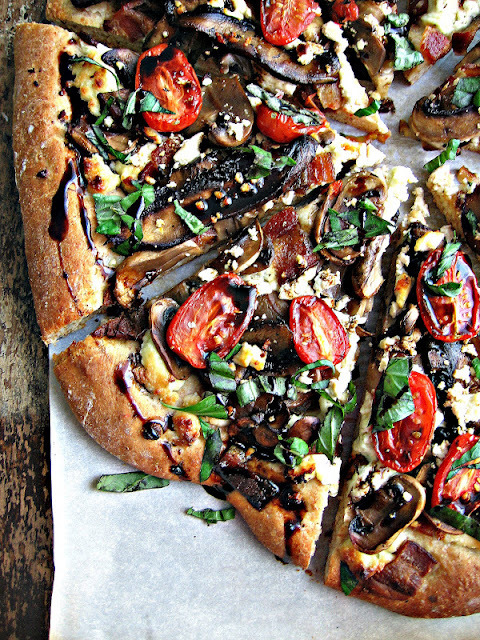 Looks amazing- love the balsamic! Renee, this pizza looks so lovely! I'm not even a huge mushroom fan, but I'd be more than willing to indulge in a slice or four of this! Congrats on your feature on Mushrooms Canada! Your pizza looks divine- I can't wait to try this combo. For some idiot reason, I've never put bacon on a pizza. Must correct that ASAP. Happily, I make pizza on a weekly basis so it won't be long before I do. Though I am so diggin' your balsamic drizzle and the bacon. Looks amazing! Hi Rene, Mushrooms Canada has change their website a bit and the link no longer takes me to your recipe :( would you be able to post it? I'm happy to re-print it for you! In a large bowl, stir yeast into warm water and let sit for 10 minutes. Whisk in the eggs, sugar, salt, and oil until foamy. Slowly mix in the flour and herbs, mixing well until everything is absorbed. The dough will be soft but not too sticky - if this happens just add a bit more flour. Drizzle some more olive oil into a large bowl and place your round of dough inside, turning it over to coat in oil. Cover with a tea towel and let rise for an hour in a warm spot. Dough will double in size, then punch it down. Divide into three portions. For this recipe you only need one portion, so go ahead and freeze the other two for later use. Cool! Pizza dough in the freezer! Melt 1 tbsp of butter in large skillet and fry the portabella mushroom slices until soft. Remove from pan. Melt the other tbsp of butter and fry the remaining button mushrooms, until soft and all liquid is evaporated. Season with a little salt and black pepper. Remove from heat. On a lightly floured surface, roll out one third of the above pizza dough recipe, so it’s around 12” by 16”. It doesn’t have to be perfect - it’s pizza. The thinner you roll it out, the thinner it will bake up, obviously. Place on a pizza stone, or a parchment lined bake sheet. If using a pre-made crust you can proceed with the following as well. Scatter the Boursin cheese over the base of the crust. 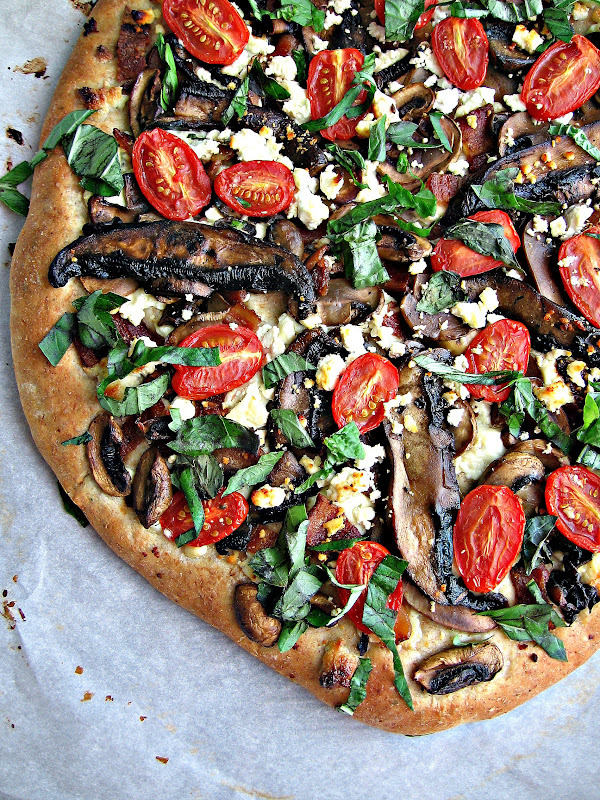 Top with bacon, mushrooms, tomatoes and crumbled feta. Place in the lower rack of a preheated 400*F oven and bake until golden, 20-30 minutes, checking centre for doneness. (If using a pre-made crust, your baking time will be less). Sprinkle the pizza with fresh basil before slicing. 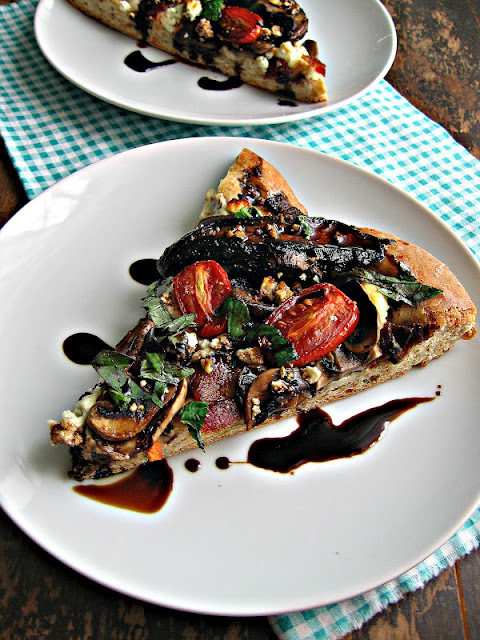 While the pizza is cooking, pour ½ cup of balsamic vinegar into a small saucepan or skillet. Bring to a boil and simmer for 8-10 minutes until it begins to turn syrupy. It will thicken as it cools. Pour into a squeeze bottle. Let pizza stand for a few minutes before slicing. Drizzle with balsamic reduction. Serves 3-4.